The VIX (volatility index) is a financial index which measures the expectation of the volatility of the stock market index S&P 500 (SPX). The higher is the value of the VIX the higher are the expectations of important variations in the S&P 500 during the next month. Since volatility is a measure of risk in a portfolio, managers tend to flee away the market when the VIX increases. The question today is to know whether it is a good strategy to use the VIX as an indicator of risk in the market, as a fear-index. 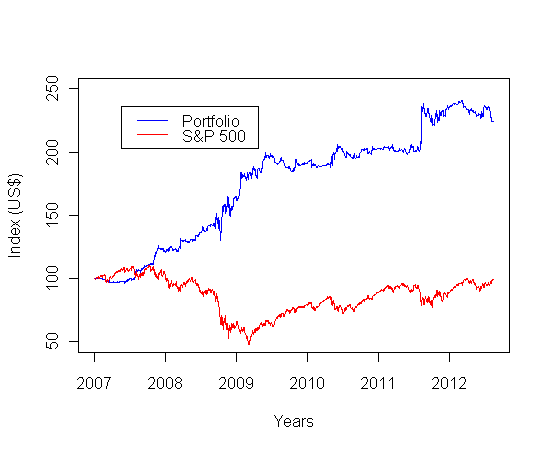 I downloaded the historical prices of both the S&P 500 and the VIX. Even though the VIX is not in a currency unit but in percentage, we still call the data historical prices. I propose a very simple portfolio strategy which is in total contradiction with the idea that the VIX is a fear gauge. I have a certain amount of money at the beginning of the year 2007, and I can short or long on the S&P 500 in the range of the money I have. My decision for a day only depends of the profit made by the VIX the previous day. If the VIX has increased I long on the S&P 500, if the VIX decreases I short. To define the quantity to invest in, I use a re-scaled and translated logistic function so that my decision is smooth and stay in the range I defined just before ([-1;1]). If you are interested in the logistic function you can go on the page of a good mathematics website: http://mathworld.wolfram.com/LogisticEquation.html . Or even on the Wiki page (don’t worry I’m not crazy, I don’t trust Wiki, but this page is Okay): http://en.wikipedia.org/wiki/Logistic_regression. With such a strategy which is against the mainstream of the portfolio strategies we have some good results (see next figure). If you had begun your portfolio manager career the 01/01/2007 with a huge amount of…100$ and had decided to invest according to the previous strategy you would have clearly over performed the S&P 500 index. You can see this on the following graph. Next time your parents tell you a story about the monster VIX don’t be scared!